Art therapy uses the creative process of art making to improve and enhance the physical as well as the emotional well being of patients. With the support of the art therapist, patients are provided a creative tool to confront and work through their emotional and physical pain, increase self-awareness, regain a sense of self, and help express unspoken and often unconscious fears and concerns about their life experiences. The goal of art therapy is to understand the inner world of our patients. When a child or a teenager is facing a significant health challenge, he or she will often face invasive, long-term treatments, such as surgeries, rehabilitation and countless medications. The patient may not have the words to express their thoughts, fears, or emotions to verbally express how he or she feels during such a devastating time in their lives. Art therapy allows a patient to non-verbally express their difficult feelings through an image or a color and provides them a creative outlet. 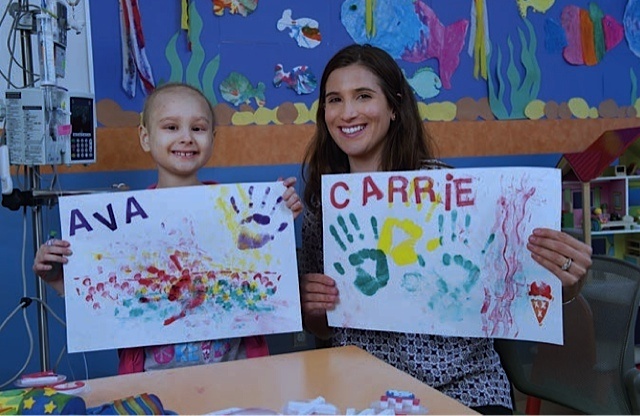 In this article, featured in Miller Children’s & Women’s Hospital Long Beach Annual Report, Ava, a pediatric oncology patient, and her mother, Andrea, were interviewed about our art therapy program. They share how the program has positively affected Ava emotionally and physically throughout her treatment. If you are a parent or caregiver of a medically ill child or teen, please encourage him/her to create artwork throughout their treatment. Creating art builds a sense of competency and control. Experiencing a very stressful life event, such as a diagnosis of cancer or other serious illness can be very confusing and scary for any child or teenager. Something as simple as providing different sized paper or a variety of art materials or colors, allows the young patient to take control of a rare moment in their life.